Imagine a farm. Somewhere, the soil is too wet or too dry. Somewhere, a fungus or other pathogen is starting to take hold. Somewhere, the crop needs fertilizer or insecticide. It’s difficult to say where without walking every square foot of the farm. And even if you did take that walk, you’d need x-ray vision to tell you exactly which healthy-looking plant is about to get sick and turn yellow. If it were possible to give every square foot of the farm exactly what it needs, when it needs it, two things would happen: Farmers would get a bigger crop yield, and use less input – water, fertilizer, fungicide, pesticide, etc. This means less cost to both farmers and to the environment. This, researchers say, is what drones can do for farms. They fly over fields, collecting data that goes far beyond what the human eye can see, such as tiny differences in temperature indicating plant stress. Drones may sound scary – in fact researchers prefer the term UAV or UAS (unmanned aircraft system) – but they’re widely predicted to be a breakthrough tool for farmers. 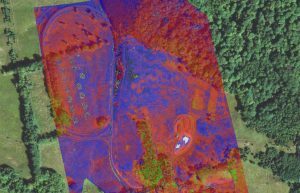 A recent report by an international UAS industry group determined that precision agriculture and public safety represent 90 percent of the potential markets for drones in the U.S. The FAA plans to start allowing commercial drones by 2015, but there is already plenty of work being done and money being invested into the technology. Notably: Indiana State University’s Innovate Indiana Fund and Bob Young, founder of the open source software company Red Hat, are funding a Canadian UAS company called PrecisionHawk, which has a U.S. headquarters in Indiana. PrecisionHawk president Ernest Earon views agriculture as one of the most promising applications for drones. “Agriculture is a very sophisticated industry and [farmers] are very data hungry — and they have not been well served, historically, in providing that data. They need on-demand data, they need it very high resolution and they need it often,” he says. The company’s unmanned aerial vehicle (UAV), called the “Lancaster,” weighs three pounds, measures three feet long and is designed so farms don’t need an expert on staff. The plane itself is easy to launch — it’s thrown into the air by hand and can be used with a number of different “plug and play” imaging sensors, including thermal (infrared) and hyperspectral, to collect field data that’s both visible and not visible to the human eye. With different sensors and algorithms, growers can hone in on specific problems or information, such as soil moisture or crop disease. The same concept extends to livestock — sick animals will be slightly warmer, and infrared sensors can pick up the small differences in temperature. 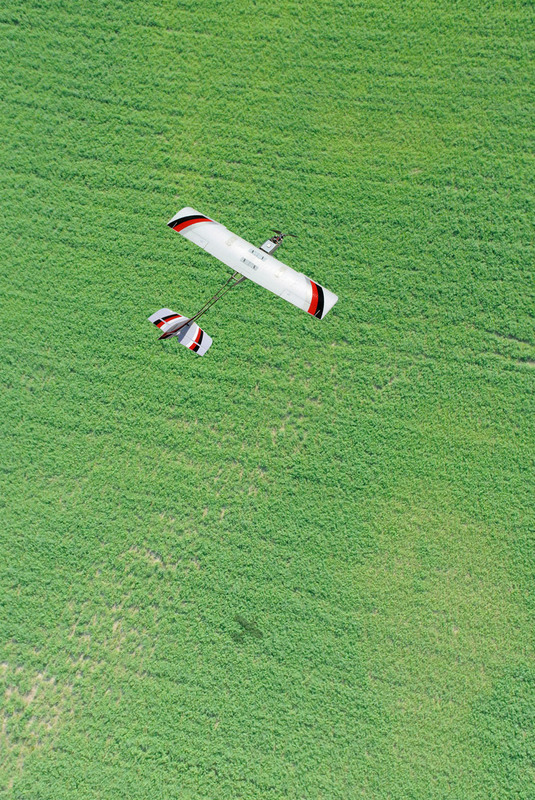 The PrecisionHawk UAV uses its onboard intelligence to determine the quality of the images that it collects. If the images are collected with a high confidence level the UAV will upload the data to the cloud automatically. The multispectral view overlays the visual imagery showing a normalized vegetation index that depicts vegetation in near infrared light detecting chlorophyll in plants. PrecisionHawk is not disclosing any of its customers, but UAS researchers at Indiana State University, who have worked with several different unmanned vehicles, are giving the Lancaster system excellent reviews. “So far that has been one of the best platforms that we’ve used as far as accuracy, coming back to land, the pictures, being able to take the information that it received while it was in the air and thread it together on the ground and get good pictures – it’s been probably the best,” says Jeff Hauser, director of the unmanned systems program at the university’s College of Technology. He’s also a brigadier general in the Indiana Air National Guard. Hauser’s colleague Richard Baker, who is head of Indiana State University’s Center for Unmanned Systems & Human Capital Development, believes a system like PrecisionHawk’s would make sense for many farmers, noting that the average size farm in the U.S. is 418 acres. Baker guesses that farmers could reduce their use of herbicides and pesticides by 40 percent, and their use of fertilizers by as much as 50 percent. “I mean we’re talking huge decreases in the amount of cost — and better quality of the crops,” he says.